Mushroom Kingdom 2 - The Dark Side [Open collab!] - Now with Discord! PM/DM me to join! 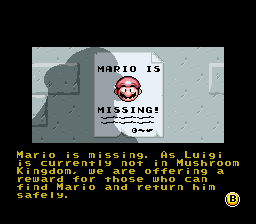 Forum Index - SMW Hacking - Works in Progress - Mushroom Kingdom 2 - The Dark Side [Open collab!] - Now with Discord! PM/DM me to join! DSotK has got a restart and a new name! Welcome to Mushroom Kingdom 2 - The Dark Side's hack thread! MK2TDS is an open SMW team hack which aims to be fun, consistent, interesting and original, acting as a sequel to Mushroom Kingdom - Under Crimson Skies while also retaining the spirit from the old Dark Side of the Kingdom collab started and led by Buried Alive. In other words, it's a hack which retains the original SMW feel in most aspects, while taking some liberties. This project is a big one, although it doesn't aim to be the next JUMP or VLDC collab. 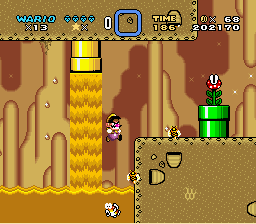 It uses the maximum amount of exits that the original SMW can provide - up to 120 exits. Anyone - yes, anyone, no matter your hacking skills - is allowed to take part in this project by contributing with levels, submaps and music in special. But other contributions such as ASM, graphics, playtesting and feedback are also really appreciated and wanted by part of all members. So don't hesitate to join in the team at all! You shall have my and other guys' help in this quest! > This hack has 8 worlds, 95 levels, and 120 exits. > Difficulty range: easy to hard. > This hack uses no enhancement chips. > Wario is the main character, and he can do a dash attack by pressing L/R. > Flowers/Feathers are used. Yoshi, however, is not - baby Yoshi is replaced by a friendly Muncher called Alcy, which never grows up. > Soundtrack will be entirely original. Custom sample usage will be discussed, but we'll probably make a global collection of samples to use rather than going free-for-all or unsampled. BIG FAT NOTE: ROM uses LM 2.53, so if you wanna join, take that in account! LM 2.53 is now included within the base ROM ZIP file for convenience. So yeah. If you want to apply as a designer/composer/helper, you can simply post here, send me a PM, or DM via Discord. I'll them provide a briefing on how you should work on your resource (theme and gimmick suggestions, level length, difficulty, etc. ), and you can start working. I might upload videos in the future as well, so, if you're just looking for updates, please stay tuned. Despite this being a collab, it's my main project, so I assure you that progress will be made from time to time. Happy hacking, and good luck to all of us! Here's a video of Fishin' Boo Pool. 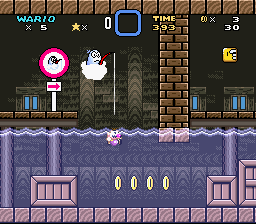 The gimmick revolves around a Fishin' Boo that acts similarly to Lakitu from the Mario Kart games. 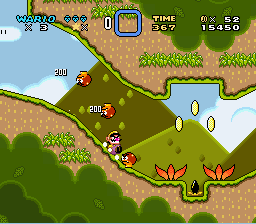 When the player falls in water, he's picked up and moved a few screens to the left. So, the player has to control the water level in order to proceed, and also be picked up in specific points. Feedback is very much appreciated. 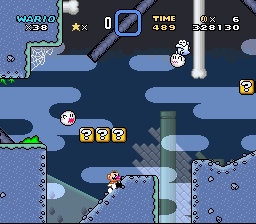 The only suggestion for the Fishin' Boo level that I have is to mark the points past which you have to go to trigger the next Fishin' Boo respawn area. How does the dash work? Could you show a video of it in action? Also are the diamonds saved or just bonus items like Yoshi Coins? I'll take the suggestion in account, I just dunno what kind of indicators I could use. Perhaps little signs? As for the dash, it works like this: you press L or R to trigger it, and when you let go the button, the dash attack is performed. It can only be performed when Wario is big, and it can kill certain enemies like when sliding downhill. It can also break some blocks. The first level of the hack introduces these mechanics, and a video will be uploaded soon. Lastly, the diamonds are saved, and they'll have a role in the final postgame level. Video of W1-1, Dash 'n' Smash! As requested, it shows how Wario's dash works in the game. The level is very basic aside from that. In fact, it serves more as a short guide to demonstrate the new mechanics. Been busy dedicating myself to moderation and other stuff which prevented me from progressing and updating this thread for the past almost two months. But here we go! MK2TDS exists and some recent progress was made! My girlfriend and I have worked on a honey-themed Ghost House, named Daunting Diet. 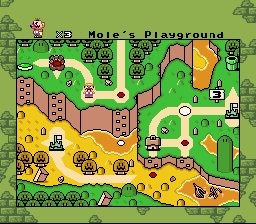 It revolves around sticky honey blocks, Stretch Boos and Lemon Drops; lolyoshi did a lovely level named Petey Garden for world 1 revolving around Volcano Lotuses; and I finished revamping an old castle level from DSotK, now named Hellfire Castle, which revolves around... fire, lol. A custom boss was also coded for it, and a video may be released when it gets proper graphics. For now, hooray for screenies! That's all for now. I'm also taking this opportunity to invite you again to participate on this project. All help is welcome. As of this post, all claimlist documents, base ROM and info are found in the first post. Be sure to take a look at stuff in there if you want to contribute! In other words, the Discord server is dead as well. That is because today I'm getting unemployed, and the lack of intenet access will prevent me from being active in Discord. The management of this project will happen here on SMWC from now on. And I also hope this makes everything easier for people who wants to join. I don't care where you put me, but I would like to do a underwater level. I'll want to use matho's muti step scrolling in the uber section. I might like to use a couple custom blurbs too, though I haven't fully decided that yet. Ey, this looks amazing by the way. It's a shame no one ever commented, but yea it looks good as of now! That is because today I'm getting unemployed, and the lack of intenet access will prevent me from being active in Discord. How are you going to coordinate a medium-scale collab if you have limited internet access? Idk just curious, but I'm sure you can figure things out. Maybe I can participate? I'm not sure if I can start right now but I feel like doing something different for once. Also I'd rather have you (or one of the leaders) tell me what kind of level to make instead of choosing myself, but if comes to it, I guess I can claim a cave level. @zacmario: Cool! I like the multistep autoscroll and blurps idea - they can make it to a simple yet engaging level. Level 00B or Level 115 would be the most suitable for that. Personally, I'd prefer if you picked 115 (W2 levels should be more Cheep-Cheep focused). The first underwater level of the game, located near a large waterfall. Since the world is named after Cheep-Cheeps, these could be the main enemies. Using other kinds of water enemies are welcome, with exception of Torpedo Teds. A water level in the sky. In the neighboring area of the map, there will be a shipwreck, meaning that you can have enemies such as Torpedo Teds and Bullet Bills, and also use logs and other decoration that can resemble parts of the ship. Once you decide which level you picked, you can start working and let me know so I can put your name in the list. @Chihaya: Thanks for the feedback! About the hack management, I'll do my best to check the site every once in a while to see if someone claimed something, has questions or has finished/sent me something. Downloading resources/updating lists will be done on a weekly basis depending on the needs, with assistance from my girlfriend. At the current pace, I think I can handle everything well. But if the need arises, I'll get more people to help managing this collab. A frozen cave level. Apart from the slippery physics, the level could have a few water pools (swimmable, and without air meters of any kind). You have a lot of freedom with sprite choices here, as long as you try to avoid fire-based ones. A random idea I had is to have Rip Van Fishes and Whistlin' Chucks in some of these water pools, making up for tough challenges if the player falls in water or something (like getting the secret exit). Secret exit leads to the blue switch palace. If you decide to do it, you can start working and let me know so I can put your name in the list. If not, feel free to pick another one! As for me, I'm probably going to work on revamping a few old songs from DSotK. Once I'm done, I'll provide SPCs for you guys to hear. Ok, I would 115 then! Im not sure how to incorporate clouds ship and water, but I'll figure something! Do I need to rip the tilesets or are they in the rom already? 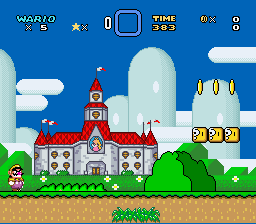 You can use stuff from SMW to make ship/wooden decorations, and download SMM's SMW-styled ship graphics. 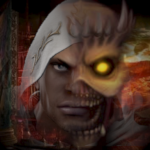 Feel free to make your own mixed ExGFX if desired. Claimlist will be updated soon. 115 is yours! ok, sounds good to me. I'd probably need two sub-levels as well. 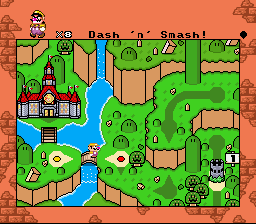 One for the beginning, where wario will enter the ship from the clouds and a bonus area. 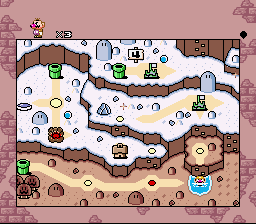 At first I was like "uhh, ice-cave level.." but now that I think of it, it's been a while since I made a slippery/snow/ice level, so I think it'll turn out good. Sign me down! I was about to ask, then I remembered that the OST will be entirely original (?). I'll be looking forward for some SPCs to hear, it's better to design something when you have it's songs in mind. @zacmario: No specific slots. Use as much resources as you need as if you were making your own hack - just be reasonable and you'll be fine! As for the sprites, you can use the per-level slots. I still haven't ran into any softlocks so far, but if it ever happens, I know a workaround so don't worry. @Chihaya: Okay. Name added to the list! Good luck! As for a song to inspire you, here's the ice cave theme! Something that came to mind when you said that the discord server was dead; doesn't it makes the thread kind of confusing if we simply dump everything here? It might be on my end, but pixi just flat crashes, and uber is complaing about a something ceiling asm file. Because I a fan of Mushroom Kingdom - Under Crimson Skies. @toad64: Okay, 00B is yours! Name will be added to the list next week (mobile data is almost over so I can't access Google Drive now). As for the PIXI problem, that's strange. It's working cool for me. And about DauntingCeiling.asm, I forgot to add it to the folder. For now, base ROM is temporarily unavailable until I can fix these things (and there was a restore ROM in there somewhere so uh my bad). I'll be away until Monday so please be patient. Well I was running Linux, running the .bat in windows today solved the pixi issue. And for my purposes I'll just comment out the missing file, so I can continue. Weird, the included PIXI also "crashes" for me, it does nothing after inserting the shared routines and just stays there. Had this same issue before with my own pixi but I don't remember how I got to fix it lol. I'll be waiting on you to call out what to do. As for a song to inspire you, here's the ice cave theme!